DriveThruRPG’s Black Friday thru Cyber Monday sales are live! 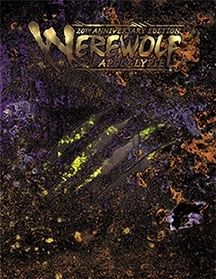 Our big-ticket item is Werewolf: The Apocalypse 20th Anniversary Edition, whose PDF is available for an incredible 50% off! Our partners at White Wolf also have deep sales going on on 119 different products! This includes Vampire: The Masquerade 20th Anniversary Edition and nearly every other core rulebook ever produced! Also participating are our friends at By Night Studios, who have six products available, including their recently released Mind’s Eye Theatre: Werewolf: The Apocalypse! Get 35% off sweatshirts and hoodies, and 20% off other merch in our RedBubble store! Use coupon code “BLKFRIDAY”.